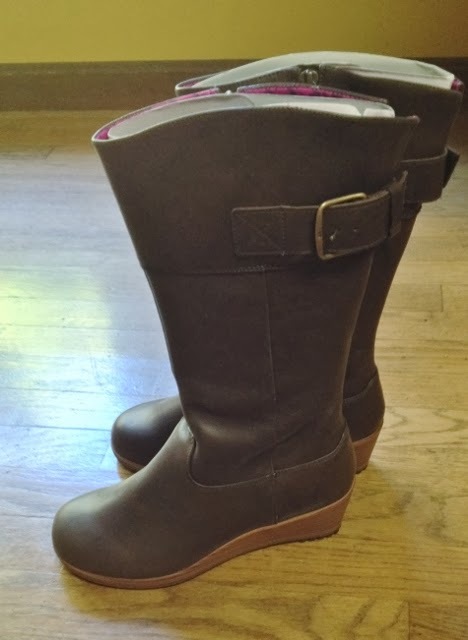 I received a pair of Crocs boots in exchange for my honest review. Crocs boots? Who knew? I certainly didn't. Although I had seen quite a few cute Croc shoes of late, I had no idea that they offered boots, too. And I LOVE boots! I am so super happy that boots are in big right now, so when Crocs offered for me to review anything on their site, I jumped at the boots. I selected the A-leigh Leather boots in Expresso/Walnut. But let me tell you, looking around at the site, I was tempted to choose some shoes instead of boots because they have so many really nice styles. But I kept going back to the boots. Love that they are leather, love the color combo and love the style. I ordered the boots a half-size up based upon review people wrote and the fact that I generally like a thicker sock in my boot. These have ample room with a regular sock, so I think they will be perfect with a thicker sock. I love all the features of these boots. First, they are leather. Oh, I already said that, but it is so important to me. Means they are going to last and I like to keep boots forever. Seriously--I have a pair from the 80s that I am still wearing! They are also super lightweight--perfect for packing. They feature a cute, colorful houndstooth lining which just makes them plain fun to put on. They zip for easy on and off. The cute buckle is adjustable for wider calves. They have a small wedge heel which is great for shorties like me. They are comfortable and have rubber soles to improve traction. And did I mention the style? They look great with skinny jeans or skirts and dresses. Very versatile. Love, love, love! And guess what? Crocs is sponsoring a giveaway on my blog. One of my lucky readers will win a pair of Crocs of their choice from www.Crocs.com, up to a $75 value! Just enter the easy Rafflecopter giveaway below. I like the A-Leigh leather boots also! They look so comfy!! I like the adele suede boots. I like the Ocean Minded Women’s Aolani Slip-on Boot in black. I like the women's Airy Boot. I like Women’s Adela Suede Moccasin. I love the A Leigh Wedge pump. The boots are a close second. I like Harborline shoes in brown. I like the Cap Toe wedge & flat! I am in love with the Adela Suede Boots in the khaki/viola color! Their server is down but I love Croc's I have the old style I wear them all the time. I like the Adele boots! So cute! Crocs had an internal server error. I love the boots you are wearing! These boots look really warm! Love them! I like the Kadee flats. I have a thing for boots, the Adela Suede Boot is beautiful. I love a wedge heel and the ones you picked out are just perfect!! I agree with you about them being real leather, too! The Ocean Minded Women’s Aolani Slip-on Boot in black is very cute!! Thank you!! I love the Adela Suede Boots in Khaki/Viola! I like the Women’s Adela Suede Moccasin in Espresso!